Where do I use my Door Superstore voucher code? Whether you’re a homeowner, landlord or tradesperson, Door Superstore is home to an abundance of internal bedroom doors, folding doors, fire-rated doors as well as hinges, locks, handles, fixings and everything you could possibly need for a rapid and professional installation. Having been in the business for the last 25 years, you can shop with ease knowing you’re in the best hands when it comes to all things Doors. With the vast range of accessories available too, everything you could possibly need is on hand at Door Superstore. If you’re in search for the most modern style doors for your home, why not upgrade to smart locks on the outside of your home? Keyless entry is the latest tech in the door industry so if you’re looking to give your home an updated look, Doors Superstore has got it all. What’s more, you don’t have to spend a fortune in refurbing your interior and exterior doors, using one of our Voucher Codes or Deals, you can make great savings when you purchase online so don’t hesitate to check out our deals page before heading to the checkout. Shop over 10 popular branded interior doors to help give your home that updated look! Including well-known brands like XL Joinery, Premdor, LPD, JB Kind and Deanta to just name a few, you can find all types of styles and finishes to fit exactly what you’re looking for. From grey & white internal doors to panelled doors, louvre doors, oak & pine doors as well as glazed doors and room dividers - compliment each room perfectly at Door Superstore! The expert team understand that every home is different and everybody has different taste, it’s for this reason they make it easy for you to find the perfect door for you to help transform your living space. Thanks to the huge variety of external doors available at Door Superstore, finding the right door has never been easier! Shop over 100 options including traditional wooden doors to more classic, stable doors as well as panelled or glazed doors. Not every house is the same and it’s important that the external doors are in keeping with the overall aesthetic which is why Door Superstore is proud to offer such a diverse collection. For something more traditional, opt for external hardwood or oak doors - or, choose something more efficient like triple glazed doors. Enjoy an abundance of style to suit your taste and don’t hesitate to add one of our Voucher Codes onto your order at the checkout to secure a great saving! All delivery charges will be displayed in your shopping basket and are dependent on the products you are purchasing. Find more delivery details here. If you wish to make a return, you will need to contact the Door Superstore Customer Service team to request an exchange or refund. Items must be in their original condition. Door Superstore offers a wide selection of doors for both internal and external use along with an abundance of accessories including Hinges, Locks, Handles and much more. 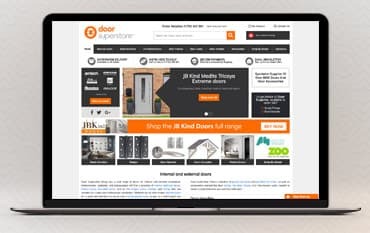 Whether you’re looking for new internal doors as part of a simple home refurb, or you’re wanting a glazed door, sliding doors or something more, Door Superstore have got everything you could possibly need! What’s more, shopping online using one of our Door Superstore Voucher Codes could help secure money off your next purchase.